On August 24th, 2012, Top Fuel motorcycle drag racer Peter Svensson, of Sweden, while racing during the Scandinavian Internationals, fired a shot heard round the drag racing world when he became the quickest drag bike pilot on the planet. Svensson, piloted his home made Top Fuel bike to a 5.709 elapsed time in the quarter mile at his home track of Tierp Arena, and announced to the world that America was no longer home to the worlds quickest drag bikes. There’s a new kid in town and he’s to be taken seriously. A fascinating aspect of Svensson’s record run; at the 1000’ foot mark on the pass, Svensson was traveling at 238.65mph and he SLOWED the bike to a 220.9mph final speed at the quarter mile mark. He clicked it off early as the bike was drifting to the right and he was in the right lane. Better to be safe than sorry at 238 miles per hour. So what if you’re ONLY going 220 at the final stripe. Please note, this was not Peter Svensson’s first five second elapsed time slip. The first time his bike crossed into the elite sub-six-second quarter mile elapsed time zone was on, August 1st, 2009, at the Gardermoen Raceway, near Oslo, Norway, when this yellow bullet traveled 1320 feet in 5.93 seconds. This run was made during the annual Drag Challenge event at Gardermoen, and was the first “five” ever run by a T/F bike outside the United States. Svensson is not alone in the International assault on the five second elapsed time zone for Top Fuel motorcycles. Ian King of Brittan also crossed the sub-six-second zone by running a 5.98, on June 16th, of 2013 at Tierp Arena in Sweden. This journey of high performance into the realm of Top Fuel motorcycle drag racing began in childhood for Peter and his brother Soren Svensson, Peter’s crew chief. Their dad grew up on a farm and the work ethic that comes from farming is one where hard work every day is a given. This coupled with the fact that their dad was also a furniture maker is where their love and appreciation of craftsmanship comes from. Dad’s spirit and appreciation for precision rubbed off on his sons. 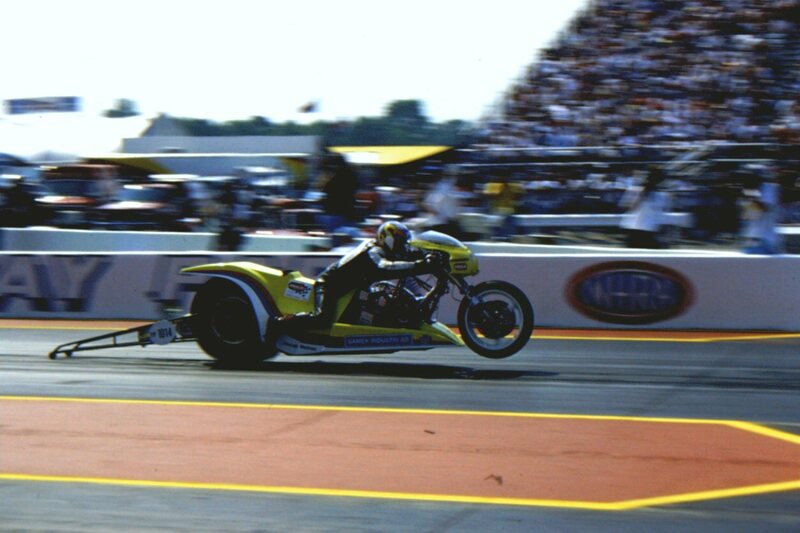 In 1997 at the NHRA US Nationals, Peter Svensson of Sweden leaps from the starting line with his home built Top Fuel bike. © 1997 Tom McCarthy, all rights reserved. Later in life, their father bought a car repair shop along with a friend, and the shop had all the curious implements that catch the eye of a young man’s fancy. This was the beginning of the brothers Svensson’s fascination with all things mechanical. Then dad threw gasoline on curiosities fire without knowing it. He took the boys to a drag race in the town of Vargarda, Sweden. It was there they got their first dose of nitromethane. The race had a AA/FC in action as well as an assortment of Triumph and Norton powered drag bikes, some of which had supercharges attached to the motors. The boys were quite excited by this and they vowed that one day some how, some way, they would get involved in drag racing. Around age 15, in 1980, Peter began building his first 50cc drag bike. In the spring of the following year, the brothers took to the track as a team and their journey began in earnest. They competed for the Swedish Championship in their class and finished in third place. They managed to set a new record along the way of 15.64 seconds at 78 mph for the 50cc class. Today that drag bike resides in their shop to remind them of their roots in motorcycle drag racing. As they aged and matured along with the sport of motorcycle drag racing in the 1980’s, when time and money permitted, they built their first serious big bore drag bike, a 1200cc Kawasaki with an 80 CID Magnacharger on it. They spent years racing and refining the bike as they progressed in motorcycle drag racing. Different fuel delivery systems and different fuels were tried including nitrous oxide injection. They spent the better part of a decade getting all they could out of that bike. Along the way they learned a lot about motorcycle drag racing. Their best numbers for the machine – 8.15 at 164 mph and they won the Swedish Championship in their class in 1989. However they had taken the combination about as far as they could. Cylinder head cracking was now becoming a problem and they knew they needed a stronger more powerful combination to withstand the thunder they were out to produce so life gave them a new combination that came together like a perfect storm. By 1990, Peter was now age 25 and Soren was 28, and as men their lives had evolved in and around machinery. Peter, after graduating high school, entered the field of machine shop and progressed his skills by becoming a tool & die maker. He also obtained a background in CNC machining and learned not only how to operate the CNC machines, but how to write their programs. If one were to consider their love of motorcycle drag racing as storm front number one, then added their machine shop skills as the second storm front moving into collision course forming the second storm front this set the stage for the third and final high pressure front moving into place forming a super-cell enter: Stefan Reisten. As the Svensson brothers progressed in their motorcycle drag racing, they of course traveled to as many big events as they could to see and learn from other racers. The one racer who impressed them the most was fellow Swedish racer Stefan Reisten who raced in the class Top Fuel bike. Stefan started out in 1977, racing a 450cc Honda and he chose to stuff a supercharger into that bike and from there on, he was always endeavored to be the big dog. In 1984, Stefan faced Elmer Trett at Long Marston in an epic Top Fuel “Trans Atlantic” challenge. Unfortunately Stefan suffered a parts breakage in the final round of that race as Elmer thundered to a 7.30 at 193mph clocking, the quickest and fastest of the day in the UK. Not to be out done, just a few months later, Stefan clocked 7.19 at 197 mph at Mantorp Park in Sweden and called Elmer to appraise him of his success. Much to his delight Elmer congratulated him with, “good numbers” and their friendship flourished. Stefan Reisten is well revered in Europe as a great innovator in Top Fuel bike much as Trett is in the USA. Watching all of this unfold, the Svensson brothers, made careful note of all this and in the mid to late 1980’s, this developed the final storm front needed to bring this perfect storm together when they met Reisten. Fellow Swedish Top Fuel bike racer Stefan Reisten was the toast of European motorcycle drag racing at the time, everyone knew his name. With Stefan as their inspiration, the brothers decided it was their time to join the fray and make the move to Top Fuel competition after the completion of the 1989 season. This drawing courtesy of Soren Svensson shows the vision created by the Svensson brothers in early 1990 as they began construction of their Top Fuel bike over twenty years ago. Today it is the quickest motorcycle in the world with a 5.70 elapsed time recorded in 2012 at Tierp Arena in Sweden. Photo courtesy of the Svensson brothers. It started with Peter using his engineering skills and Soren’s keen observations as they brainstormed about who was using what in T/F. More importantly, they focused on how to lay a solid foundation to bring their combination to the next level in Top Fuel bike racing. The initial drawing shown with this story was made around 1991, by Peter Svensson. 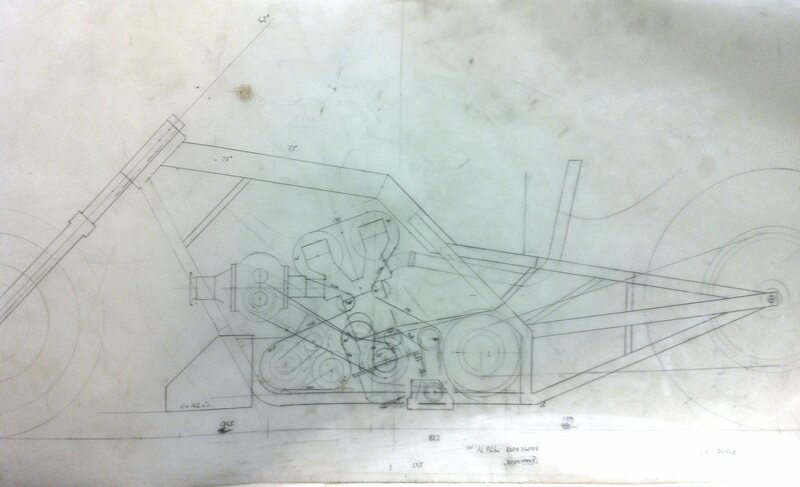 In it you can see the chassis side view and initial motor location. It took from 1990 to 1993 to create their Top Fuel motorcycle. Much of that time was Peter, the tool & die maker, in the machine shop turning large blocks of ALUMEC 66 into a cylinder head and one very stout engine block. He also created the pistons and connecting rods while he was at it. To say that the Svensson brothers are racing a home built drag bike is a totally accurate statement. But aluminum chips were not the only alloy hitting the shop floor. Peter also machined up his own crank shaft and cam shafts out of UDDEHOLM tool steel. His education in machine shop served him well in this project.
. Jan possessed a lot of “know how” when it came to engine design. An interesting aspect of Svensson’s design is the motor crank shaft has no center drive chain to rotate the cam shafts as found in most conventional inline four cylinder motorcycle engines. The Svensson motor drives the cams from a timing belt off the end of the one piece crank shaft. Peter machined the crank from the basic dimensions of a common car crank shaft so his journal bearings would be easy to acquire and change as needed. This home built, hand made engine is both a tribute to the application of modern technology and the ingenuity of the Svensson brothers. They took the time to study and understand what a T/F motorcycle needs to make power and they designed an engine that would survive that power level and then some. The results have been gratifying to say the least. This thundering burn out by the Svensson brothers shows their powerful Top Fuel bike is one to be taken seriously. © 1997 Tom McCarthy, all rights reserved. It’s safe to say their team is the only Top Fuel drag bike team racing today that is still racing with same engine block, cylinder, head, and crank shaft they designed and built exactly 20 years ago. Unlike many USA teams that always come to the race track with several motors ready to tear one out and change at a moments notice, the Svensson’s are proving if the motor is designed rugged enough and tuned well enough it will live. This proven concept is a HUGE savings for race teams thinking of stepping up to Top Fuel motorcycle racing. The Svensson brothers through intelligent design, innovation and dedication are currently the quickest Top Fuel drag bike in the world. Their historic 5.70 elapsed time pass on August 24th, of the year 2012 firmly established them as number one with a bullet. And now the Svensson’s are coming to America with their bullet loaded. 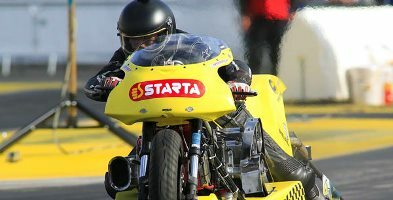 On November 8, 9, 10 of 2013, at the Bradenton Motorsports Park, the Haltech World Finals presented by the Manufacturers Cup, Svensson’s “Team STARTA Racing” will clash with the best Top Fuel motorcycles in America to see who’s the best on race day. 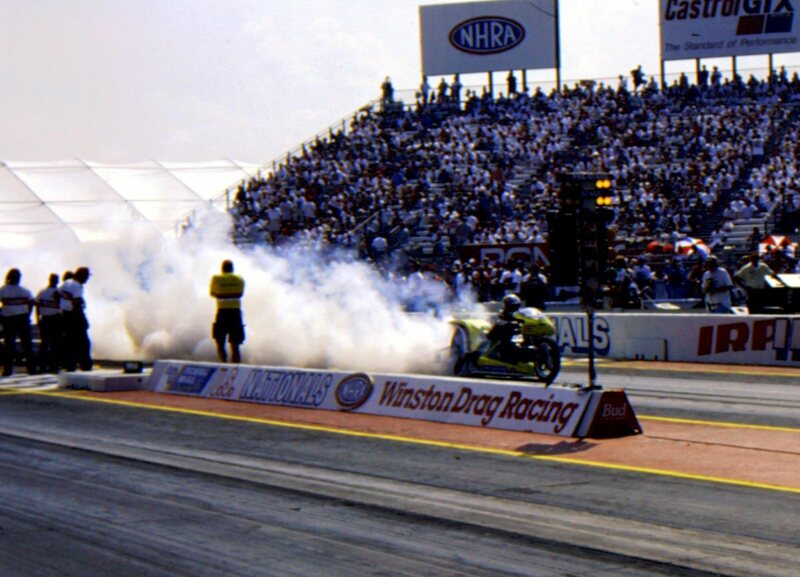 Top Fuel racer Larry “Spiderman” McBride was the first into the 5.70 zone with a 5.79 elapsed time in 2008. Will either team break their previous best, or will they tune to win? We’ll find out on Sunday, November 10th.at the “Battle of Bradenton” when these Top Fuel motorcycle titans clash. The author of this story would like to thank: the brothers Svensson, Stefan and Inger Reisten, Stefan Boman, Keith and Annie Lee, and Par Pippi Willen for their contributions to this story, THANK YOU. All our fans and family members that are supporting us towards new achievements every year!! Attaboy,, Peter. No “flash in the pan” this 23 year plan and build project. If you never threw a leg over a motorcycle again, you’d have made your mark forever…but I think we’ll be hearing from you again ! Chairman Emeritus and Publisher DRAGBIKE! Magazine, AMA DRAGBIKE! and DRAGBIKE! USA. I will learn how to use this site soon. Sorry for duplication but I had to get in that “late comment” apology.